This year, I’m getting the perfect gift for Valentine’s Day. How do I know it’ll be just what I want? I’m picking it out. Such a high-pressure day for all the guys, I feel badly for them – finding that one thing to make her melt (not an easy task). Playing cupid is one tough job. But gals, there’s no harm in hinting at what you’d like for Valentine’s Day. My guess is he’ll be glad you did. Whether you have a significant other in your life or not, check out these love-ly gifts great for giving and of course, receiving! Some of my favorite nail colors by Nubar, Layla & Seche. Be bold and beautiful or a subtle sweetheart with salon-quality nail polish by Nubar, Layla and Seche. 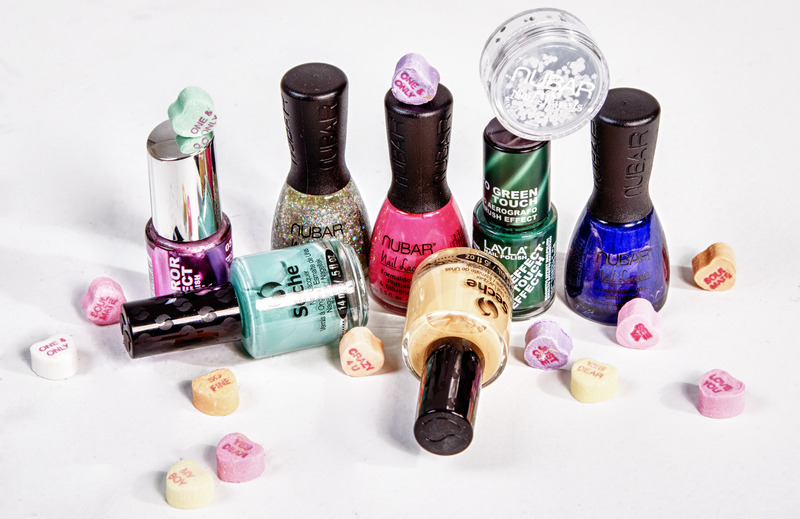 Choose glitter, nail art, mirror, gel or ceramic effect, or bright, fun solids that pop. And what’s hot now is making your mani and pedi stand out with cool designs. Play around for a one-of-a-kind look everyone will heart. Maybe you’d rather treat yourself to a day at the spa? Relax with Jericho Cosmetics in the comfort of your own home. Massage oil, bath salts, body butter – everything you need to feel pampered, pretty and most importantly, de-stressed. I absolutely love putting on the Jericho Body Lotion right before bed; its light lavender scent is so calming. The entire line is made from Dead Sea minerals, so very natural, too. SPA-mazing products by Jericho Cosmetics. Jericho Premium & Vineyard Collection Grapes make heartwarming gifts. The Vineyard Collection Grapes is quickly becoming my go-to for daytime body moisture. It has the most amazing fragrance and feels fabulous on my skin. Try the 3-in1 Massage Oil Candle; it is as romantic as it is refreshing. Or, Jericho Premium. It’s just that, premium. Want to start erasing the signs of aging this Valentine’s Day? This line is your start. This entry was posted in beauty, women's skincare and tagged gifts for her, Valentine's Day gifts. Bookmark the permalink.